Happy Vasant Pachami to all the Lovely Readers. Today I bring to you the kesari halwa recipe for toddlers and kids. Vasant Pachami marks the start of spring. The color yellow plays an important role in Vasant Panchami as it is associated with the bloom of mustard and marigold flowers during this period. People celebrate the festival by wearing yellow dresses and eat yellow sweets. This festival is also considered very auspicious where Goddess Saraswati is also worshipped. Traditionally children are taught to write their first word on this day (Vidya aarambh sanskar). It is considered as blessed start of learning with the Goddess of Knowledge worshiped on this day. Many schools have special pujas performed to invoke Goddess Saraswati’s blessings on the Vasant Panchmi day. Kesari halwa and meethe chalwal (sweetened rice) are traditionally made in many Indian homes and offered to god during this festive period. Kesari halwa is a very simple recipe with a few ingredients. It is an enjoyable semolina pudding. The semolina is lightly roasted in a little ghee and then cooked with sugar and water. The base ingredient for this recipe is rava or semolina which is a good source of carbohydrates. 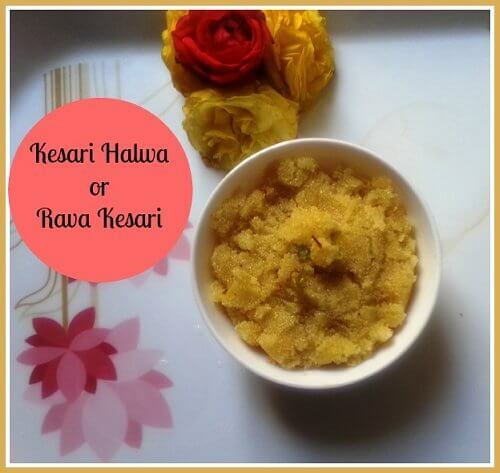 Kesari halwa or rava kesari works well as breakfast or evening snack item for toddlers and kids. I have also used kesar or saffron in the recipe which has many health benefits like anti-oxidants. Kesar/saffron/kumkumpoo imparts a very nice taste to the dish along with serene yellow color. Some people prefer to use orange / yellow food color for making sweets but as a parent I prefer to use natural ingredients like saffron or turmeric to color the desserts. Food colors should be avoided not just for children but for everybody as they can cause serious health hazards. How to prepare kesari halwa or rava kesari for toddlers? Rost rava in ghee for about 5 minutes till it changes color. Add sugar, water and saffron threads soaked in the milk. Keep stirring so that the halwa doesn’t stick to the bottom. Add pista and stir again until the halwa consistency is attained and ghee is released from the sides. Heat the ghee in a kadai and add semolina / rava (on a medium high flame). Do stir it continuously making sure that the rava roasts evenly. The kesari halwa or rava kesari has a good shelf life of about 3 days. One can also make shape the halwa into laddus and give to the kids. You can give kesari halwa to babies omitting the milk and sugar. Instead opt for jaggery and filtered water. If you are looking for other toddler recipes, you can read beetroot halwa, cooker cake, sweet pongal, peanut chikki and sesame laddu recipes. Enjoy the kesari with your toddler. Do let us know how you celebrated the Vasant Panchmi . Did you download the FREE eBook of Home remedies for babies, toddlers and kids? Neha is a Management graduate and a professional working in a reputed IT firm. She is a mother of a five year old son and 2 years old daughter. She believes in giving family a priority over work and has a passion for writing & cooking. She strongly believes that a rich diet is essential for growing kids and believes that innovation in kitchen is necessary to keep kids away from the junk food . Looks delicious! Can this be given to babies below 1 year? Good recipe for panchami Neha . I am so happy as Kesari halwa brings back so many beautiful memoried for Anu 🙂 .